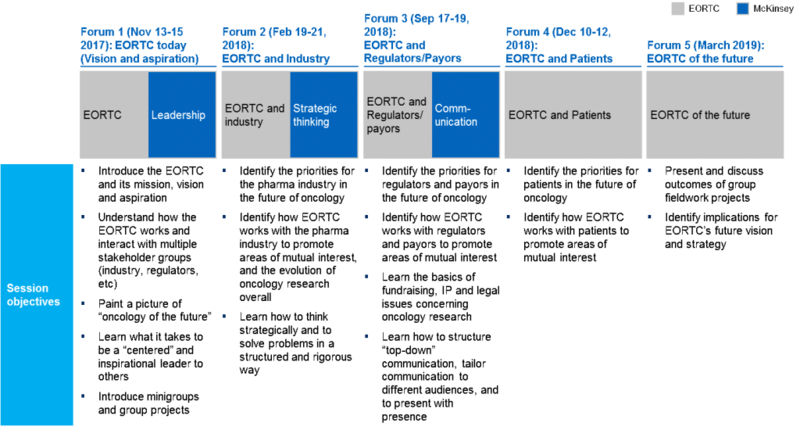 In order to address the evolving landscape in clinical cancer research, EORTC with support from McKinsey & Company, have developed a leadership programme for young investigators. EORTC aspires to build the next generation of oncology clinical research leaders who have a full understanding of the future international clinical research and are willing to serve the EORTC and shape its future strategy. The objective of this programme is to train young investigators to become leaders in international clinical research and take leadership positions within EORTC. Continuing its legacy in improving the standards of care, prolonging survival and increasing the quality of life for the benefit of cancer patients. Participants will learn strategic thinking leadership and communication skills and capabilities, which will strengthen their ability to build trust, inspire, lead, and manage communication with various stakeholders in an international setting. The programme will discuss the regulatory and operational aspects of clinical cancer research. In addition, there is potential that participants will be exposed to highly visible career opportunities, as part of the process. The programme is divided into five forums, hosted over 3 years. The first three forums will be a cooperation of EORTC and McKinsey while the two last sessions will be coordinated by EORTC. Forum structure will include reports from participants on hands-on activities, feedback on the programme and 1 pragmatic lecture by key individuals sharing their experiences through the EORTC or giving a specific vision over a selected topic. 34 young aspiring future leaders have been selected by the EORTC disease group officers to participate in this programme. The aim of creating an initiative for Early Career Investigators the European Organization for Research and Treatment of Cancer (EORTC) is to actively involve the younger diligent oncologists working in membership institutions and to increase their contribution to the various working parties, group activities, and work done in various Disease Oriented Groups (DOGs) within the EORTC.